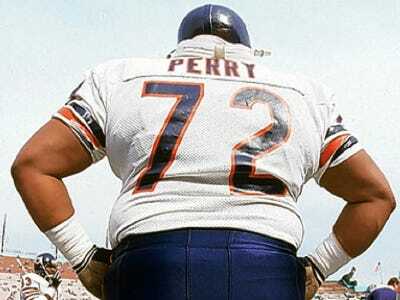 William Perry: The godfather of the modern Super Bowl prop bet. Between the pre-game shows, the elaborate half-time performances, the post-game hoopla, and, of course, the commercial-laden game itself, the Super Bowl can really drag on.Luckily, thanks to prop bets, Vegas has a way to get your heart racing for every moment of the broadcast, from the singing of the national anthem to the MVP acceptance speech. The phenomenon began with Bears D-lineman William “Refrigerator” Perry in the 1985 Super Bowl, according to ESPN gambling guru Chad Millman in an appearance on the Bill Simmons podcast. Then a rookie, Perry was used sparingly as a fullback in goal-line situations, and even scored a touchdown. Leading up to the Super Bowl, Vegas put up a bet, with 100/1 odds, that Perry would appear in an offensive play. Gamblers bet that line all the way down to 3/1. Of course, Perry did appear as a fullback and Vegas took a massive beating. But that opened bookies’ eyes to the potential for prop bets. Soon sports books expanded their offering from a handful to hundreds, and today, they get just as many bets for props as they do on the actual game. How long will Christina Aguilera hold the note “Brave” at the end of the National Anthem: (Over/Under 6 seconds). Apparently, Aguilera has held it between 5 and 7 seconds in her previous appearances, so it would be a tossup – except this is the single biggest event of the year. If you don’t think she’ll hold that note for an extra second with 100 million people watching, you’re crazy. Over. How many times will FOX mention “Brett Favre” on TV during the Game? (O/U 2.5): You serious? In a game featuring Green Bay? And with talk all week about how brilliantly Thompson handled the Favre-Rodgers transition? Give me the over. Heath Miller receiving yards (O/U 42.5) As has been widely reported, the Packers defence against opposing tight ends was weak this year, and sharps have pushed this line up nearly 10 points. But some of that is due to early-season outliers. Really, in the regular season Green Bay only gave up more than 42 yards to an opposing tight end eight times, and not once in its last seven games. Meanwhile Heath Miller hasn’t topped 40 in the playoffs, and did so only five times all year. Take the contrarian under bet. Who will the Super Bowl MVP thank first: (Coach 10/1, Family 4/1, God 3/2, Teammates 5/2, No one 2/1): We looked at some post-game interview from Roethlisberger and Rodgers (the two most likely winners) and both mention God. Upon accepting the award, they’ll thank him first, teammates second. Will a Steelers player do the Aaron Rodgers Championship Belt Celebration during the game? James Harrison and the Steelers defence isn’t exactly known for its modesty. This is a lock. Which Super Bowl commercial will have a higher rating on USA Today’s annual Ad Meter? (Bud Light 11/4, Budweiser 11/4, Doritos 11/2, GoDaddy.com 10/1, Pepsi Max 6/1, Skechers 12/1, Teleflora 15/1, Other 5/2) Doritos had some excellent commercials last year, and Bud Light always brings their A-game for Super Bowl ads. But we bet some unsuspecting company will sneak up and walk away with the most memorable ad. In fact, Volkswagen already looks like a good bet. The first missed field goal of the game will be? Wide Left (-115) Wide Right (+105) Short or Blocked (+1100) If you’re not a fan of either team, this is a great prop bet. You get your money back if no kick is missed, but the game can suddenly become interesting at any moment. You’ll be the only one in the room first pulling for a field goal, then hoping the kicker misses – but only in one direction (the better value is on right). People will look at you like you’re crazy. Pick Ben Roethlisberger Completions or Paul Pierce Points (vs. Magic): Don’t let Roethlisberger’s bad AFC Championship game, or Pierce’s reputation fool you. This is an easy bet. Roethlisberger had at least 20 completions in all but one game since he hit his stride in Week 10 (remember he didn’t play Weeks 1-5), until Week 17 when the Steelers blew out the Browns. Meanwhile Pierce has scored at least 20 points just once in the last two seasons games against the Magic. Considering Green Bay’s strength against the run, take Roethlisberger.